It's impossible to know from the files if it boots or not. If you just formatted the cf card in windows, it won't boot. In early dos days, you booted from floppy and ran the fdisk command to create partitions on your disk (cf card in this case) You had to make 1 partition active that became the boot partition. Next, you had to format the partition. After this, the harddisk became bootable. I see no other option anymore besides providing my bootable image. It's a bit of a chicken egg story. Without a bootable medium, you can't make the compact flash partition bootable..
OK could you please, please provide me with your bootable image when you get a chance? Convert a megatouch XL from cdrom to harddisk or compact flash. A compact flash card of at least 1 Gigabyte and a compact flash 2 ide adapter. A program to transfer a raw image to a disk. The files from your original cd disk. You can simply copy all contents of the cdrom to a folder. Get my freedos bootable image. remove and re insert the cf card or drive. It should come up as a drive letter. copy all the cdrom files and folders to the mega folder of that drive letter. My megatouch bios settings has all harddisks set to auto and no floppy's installed. My mobo is a Telco. I forgot 3 small details. 1. In the autoexec.bat you will find a "keyb be...." line that will set the keyboard to the belgium layout. You might change that to the keyboard layout you are using. 2. A warm reboot using <CTRL> <ALT> <DEL> isn't working. You need to power cycle the megatouch pc for a proper reboot. This is likely a motherboard bios issue and has nothing to do with the compact flash image. 3. The romdisk on the io board needs to be disabled. This can be done with the removal of jumper JP1 marked eprom enable. JP3 is marked MFG and shouldn't be touched either. Part of the problem I've noticed with my CD vs. yours is that the binaries have different names....so my script would be trying to execute something that doesn't exist. I'm not sure of obcd's image takes this into account. The reason my image was 4 partitions was because I was using MS-DOS and it doesn't have the subst command that obcd is using. Mine is launching "launchit.bat" from the f folder. I noticed on the autoexec daddy posted that the contents of that bat file seemed to be in his autoexec.bat file. It copied 2 files to the d drive and launched megacdll. I left the launchit.bat from my cd in the mega folder. So if it's not on his cd, it's not a problem. If it's there, mine will simply be overwritten. Can't remember if my launchit.bat is running the same megacdll.exe, and I am 2 lazy to go look it up. In worst case, the launchit.bat will need to be edited to launch the correct file. The major reason I posted my image was to resolve the issues that the other partitions didn't show up in windows as drive letters (To my understanding) I could use a good backup as well. I removed the mega files, shrinked the partition and zeroed the remaining unused space on the cf card. Next, I increased partition size again and took the image. Due to the fact that all unused partition space contains zeros, it's possible to seriously reduce the image size using pkzip. Thank you so much for the image! I gave it a shot but while I did make some progress, it wouldn't boot. It said "FREE DOS" with a blinking cursor and then nothing would happen after that. So at least it sees the drive and it sees freedos, but it never boots. Just sits at a blinking cursor. I did follow your directions step by step but when I copied over my CD to the mega folder, it asked me if I wanted to overwrite launchit.bat, and I said no. I figured if you had one already in the mega directory that it's probably the one you want me to use, but please confirm when you get a moment. Also I have JP1 removed so it completely ignores the onboard ROMDOS or whatever. Can you tell me what program you are using to transfer the image to the compact flash card? Have you checked the HDD auto detection in the bios? What parameters does it show you for your Compact Flash card? It's ok to use your own launchit.bat file. I wasn't sure if you would have one. That's why I left mine there. They might contain the same instructions. What os are you using to transfer the image to the card? The behavour you see is what you get if the drive parameters in the bios are incorrect. You could try a manual setup with the settings I posted. I'll check tomorrow what the working options are. Thank you so much. It must be the drive parameters because I don't even know where in the BIOS to go to change it or what to change them to. I think I am one step away from finally solving this thanks to all your help! I just tested again myself. When I restore the image on a 4Gig CF card, I get the same behavour as yours. 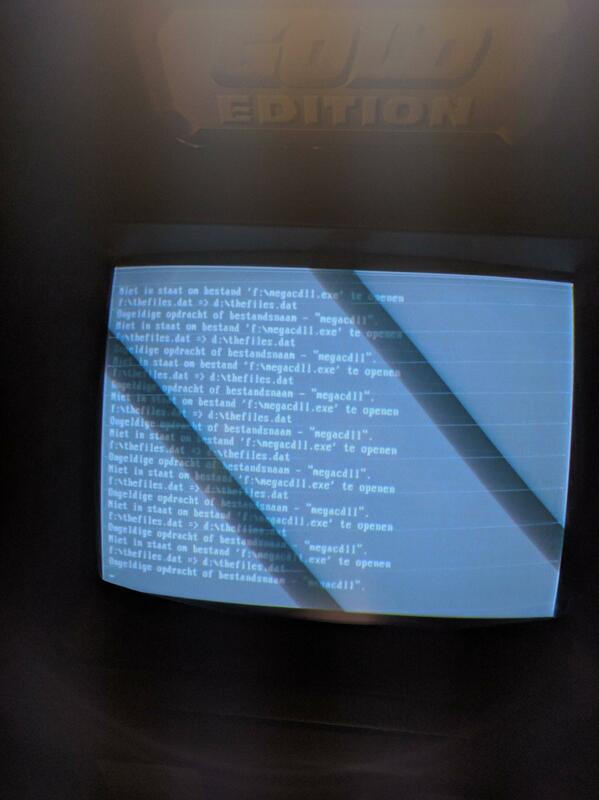 It freezes only showing FreeDOS_ on the bottom of the screen. I'll try it on the original 1Gig card again to make sure it's not a problem with the image. Next, I'll see if it's fixable when you alter the bios HDD settings. What size is your CF card? I just tested the image on my 1Gig, and it's not booting either. Thee image must have gotten corrupted during the proces of taking and shrinking it. I'll do the proces over again. I already restored the full image on a 4Gig card, and it boots again. So far So good. Will test it a bit better this time. My apalogies for this misery. Tested the 4Gig, and it booted into the game. OK good news is FREE DOS finally boots and I got a bit further this time. I assume you didn't forgot to copy the files of your cd to the mega folder. Maybe you created a subfolder under that mega folder and all stuff is in there? Wilt u batchbestand 'f:\launchit.bat' be-eindigen (Ja/Nee/Alles) ? First we might check if both d and f are created properly. This should show you all files on f with the exe extension. Those are files you should be able to run in dos. My cd has 2 such files. As you can see, it tries to launch megacdll, which in your case doesn't seem to exist. echo will simply print that line on the screen. It will disable the loop in launchit.bat. You can make the changes on your windows pc, but even on the megatouch itself with the keyboard connected. the upper menu bar can be accessed with the <alt> key. <alt> F opens the file menu which you need to save the file and quit the program. Don't worry to much, you are almost playing it again. but you should get the thing going first before you look into that. OK I guess there is something different between your CD and mine or something. I do have MegaCDLL.exe except mine isn't directly in the mega folder. It's in Mega/EXEC. So I did dump the CD correctly, but there is no MegaCDLL.exe directly in the root of my CD-ROM like it is on yours. "Hard Drive Shock Mount Failure"?? What on earth does that mean? Copying the contents of the exec folder to the root was a bad idea. We really need to find out what your cd needs to boot. So, is it having a launchit.bat in it's root or maybe another bat file. This assumes that delall.exe and megacdll.exe are in the exec folder and thefiles.dat is in the root folder. Maybe it's not like that on your cd. I'll take a look at the other image if it might reveil how it needs to be started. Maybe it needs an exec subfolder on the d ramdisk. Right now, All I can do is guess, and that's not good enough. I just checked your image. It also has a launchit.bat that seems to copy the megacdll.exe from the f:\exec folder. So maybe, try your file and see if it works with that. You might add an echo in front of the last line, as it will reboot the system in case of an error. It might not give you the time to analyse the error. OK I used the exact launchit.bat configuration that you recommended. I also wiped the CF card and wrote the image again. "Hard Drive Shock Mount Failure"
I restored the image on the 4 gig CF card and copied your image to the mega folder. It gave me the exact same "Hard drive shock mount failure" message. I am clueless about this. It works on my XL version and also on an older US version I once bought on Ebay. Maybe someone else knows the meaning of this error. 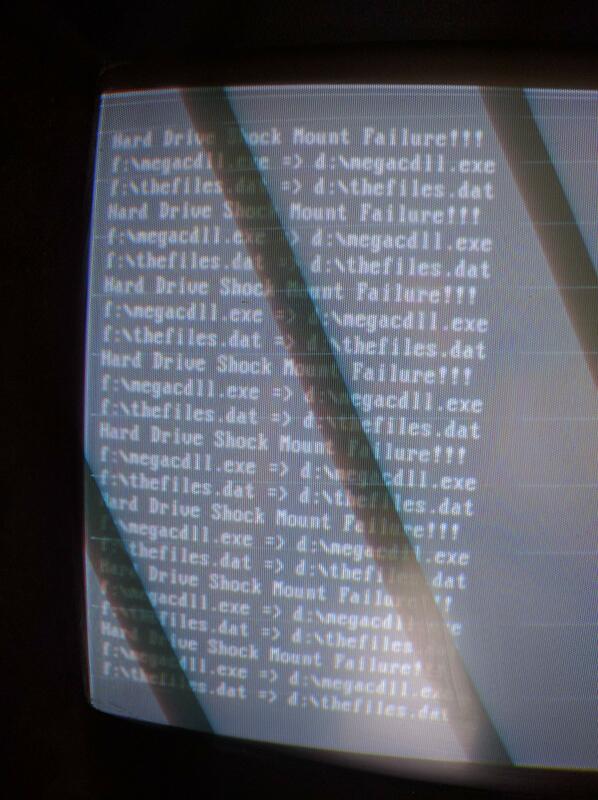 It's coming from the megacdll.exe as I can locate the text in that file. If you are willing to post the image link you got from the other forum member, I can test with that to see if it behaves any better. OK at least it's not just me then. Sent you a PM with the image he sent to me. Thank you so much. I downloaded the image and transferred it to my 4Gig cf card. In windows, it only showed the first partition. So, started my virtual debian and made my cardreader usb available to it. I got the 4 partitions. Wiped the /dev/sdb7 clean and transferred your files to that partition. Installed the CF card in my megatouch XL. It booted dos, but could only see the c partition. So, I ran fdisk and noticed that it showed no logical partitions in the extended partition. So, I deleted the extended partition and created a new one of approx 1 gigabyte. I created 4 logical partitions into that extended partition. 3 of 50 MB and the fourth using the rest of the available space. After a reboot, I formatted the D, E and F drive. copied your files over to that partition. Installed the cf card back in my megatouch. Hard Drive Shock Mount Failure !!! Maybe the Megatouch somehow can detect that nothing is resting on the CD-ROM caddy? I have no clue. I don't even know why the program knows to ask about a hard drive considering it was a CD game. Maybe Orizzle can chime in on how he got the error to not show up when he made his XL 5000 run from a CF? Which is pretty much expected behavour. I noticed that there are some zero length files in his folder with some strange names like AAADDIDC. There is no such thing with your files. They could figure out that the files are transferred from cd to harddisk as they are no longer having the "read only" attribute set. I'll do one final test with your files all set to read only. It's just a wild guess, but who knows. So, they put something in to prevent a harddrive copy from working. If it's not documented somewhere, only reverse engineering the code could give a clue how the conversion to a compact flash card is detected. OK so I am willing to use the CD-ROM drive. Never in a million years did I think this thing could detect a hard drive and prevent it from booting but here we are. Anyway, is there a way we can make my CD-ROM bootable? That way I will simply keep using the CD-ROM. Maybe put FREEDOS somewhere on the CD? I am afraid this is not possible. The bios of the TELCO motherboard doesn't detect cdrom drives and doesn't allow to boot from them. You could try to make it boot from compact flash card and have it run it's software from the cdrom. It seems possible for freedos to mount a cd image file from harddisk and use it like a real cd in a drive. Maybe this approach won't be detected. In order to test such an approach, I would need an iso created from your cd. I am unsure if the cue and bin could be converted. There is a free tool cdburner xp that might be able to take such an image. I'll check later on if your image can be converted for that purpose. Will try on freedos again with the shsucdhd and shcdx33e to mount that iso. Hopefully it works there as well. shsucdhd and shcdx aren't doing the job. There seems to be a memory conflict with the 3m dostouch tsr. Further, it increases loading times which almost double. I am just reading about a tool called fakecd that might be able to do the trick. If that doesn't work, I have reached the bottom of my magic trick box. Oh wow yeah, FakeCD seems to be a CD emulator. Hope that works. Thank you SO MUCH!! Right, the results with fakecd look good. I opened a command prompt. It should create a fakecd.dat file in the folder you specified. delete the contents of the mega folder on the compact flash card. copy the mega cd files and folders to that mega folder as well. The reason I delete and copy them again is because I am afraid that previous tests might have altered something to the files that could trigger the shock error. copy the fakecd.exe file to the c:\fdos\bin folder. This gives the opportunity to read possible errors. Normally, yours should behave different. I hope I didn't forgot a step. OK well I got a bunch further and guess what? Now I get an "Invalid key" error. I completely pulled out the Dallas chip and put it back in. I also tried cleaning the "battery" key thing and making sure it was seated properly. Still "Invalid Key" error. I have no idea how this thing worked absolutely fine last year and now the DOS ROM chip dies and the Dallas key dies, but I am pretty much going to toss this thing in the trash sometime next week. You gotta love when anti-piracy measures lock out legitimate owners! Thank you anyway everybody's help even though it didn't end up working in the end. I really, really wanted this thing to be part of my home. I already was afraid of this. You likely have a problem with your unit io card. Basically, that card combines a number of things. 4. An interface to the security dongle. If you have a problem on your io board, it can affect one or more than one of it's functions. In your case, the boot flash drive is failing, and probably the interface to the security dongle as well. It wouldn't suprise me that none of the other functions are working either. I have one lying in front of me with similar symptoms. A common problem are the pcb finger contacts or the riser card finger contacts. You cleaned those already, so you are facing other issues. I have a couple of test programs to read and write the nvram. They can be used to test it's functionallity. You could try to find a second hand io board on Ebay if you are willing to go on with the unit. If you are not, I am interested in buying the security dongle and it's small interface pcb (the board that connects to the 5 pin on the io board). The upgrade kit is expensive. It's a full pc motherboard and a harddisk, but nevertheless.. It's up 2 you how much you are willing to spend. I am a bit too late, but you are better off doing a classic force conversion. You could have upgraded for less then $100 with your existing hardware. You put soo much effort into this XL, and i commend you for it, but its just a waste of time and money in my opinion. Hi, can you explain what a classic force conversion is and what it entails? an i810 compatible mobo, a force or ion ioboard , an exii microtouch controller (serial or usb) and a force key. Now that i think about it, you could upgrade to ion for even less going by current ebay prices. The only issue is your monitor res. You need to disable hi res games. Page created in 0.227 seconds with 61 queries.